The 35 metre motor yacht White Dream, listed for sale by Princess Yachts Monaco, has been sold with Jason Duggan at Thompson, Westwood & White introducing the buyer. White Dream was built in GRP by British yard Princess to a design by Bernard Olesinski and delivered in 2017 as one of the yard’s award-winning M-class series. A bespoke interior by Fendi Casa uses gloss-finished walnut to create spacious accommodation for up to ten guests in five cabins consisting of a master suite, two VIP suites, a double and a twin, all with entertainment centres, television screens and en-suite bathroom facilities. The main saloon, panelled in high-gloss American dark cherry wood, is fitted with a vast relaxing sofa area to port, flowing forward into an elegant formal dining area for up to 10 guests. The comprehensive entertainment system includes a Samsung HD 46-inch flatscreen television with DirecTV, Bose surround sound and full internet access. Al fresco entertainment is offered on the aft deck with a settee, table, chairs and bar, while the flybridge has a wet bar, lounging area, sunpads, a six-person spa tub and dining for up to ten guests. One particularly notable feature is the electro-hydraulic swim platform, giving maximum convenience for swimming and launching water toys. 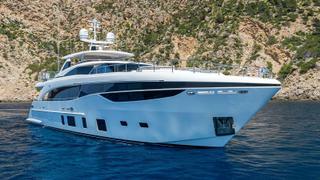 Power comes from a pair of 2,640hp MTU diesel engines and she is fitted with Trac digital fin zero-speed stabilisers. White Dream was asking £12,595,000.